Temple Sculpture Representing Ganesha and His Spouse with two female attendants beyond the columns, India, Madhya Pradesh, 12th century Sandstone Cat. 103. Both Vardhamana Mahavira and Buddha Shakyamuni belonged to the kshatriya class, as did many of the Upanishadic teachers and thinkers themselves. Both renounced the life of a householder and took to the road in search of enlightenment, practiced austerities, and adopted yogic meditation as the means of attaining liberation (moksha, kaivalya, nirvana, etc.). Fig. 13 Detail of stone fragment showing worship of meditating Buddha Shakyamuni, Uttar Pradesh, 2nd century. Cat. 150. Fig. 14 Detail of stone stele of Jina Parshvanatha seated in yogic posture, Karnataka, 13th century. Cat. 117. The image of the Jina in Indian art is the most spiritual, abstract, and detached in the contextuality of human form. 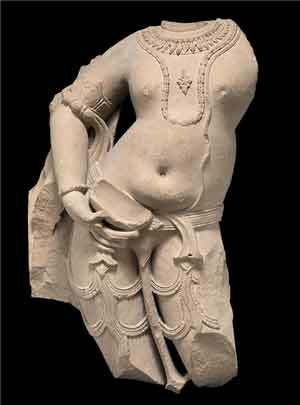 Indeed, even in the earlier art of the pre-Buddhist and -Jain period, whether male or female, the human figure is never conceived as realistic or physically ideal as in Greek sculpture. Rather, it is depicted with a looser body and more flexible limbs and smooth flesh in keeping with the body of a yogi, which is never muscle-bound and taut. The difference is easily perceptible by comparing a Gandhara and a Mathura Buddha image (see cats. 150 and 151). Less stylized and more sensuous than the Jina statue, the Buddha figure is characterized by a much greater diversity of gestures and postures. In early art, the Buddha is still a historical person, and important life events are never forgotten, being subtly alluded to with hand gestures. In the many forms of the transcendental Buddhas of later Buddhism as the religion became elaborate, the traces of historicity were abandoned in favor of symbolic meaning. Iconographic variations are much greater in Buddha images than in those of Jinas, but no matter how they are distinguished from ordinary mortals with extrasensory bodily signs of a mahapurusha (a great person) and divinized with provision of a nimbus or halo, they are never given multiple arms and hands, which is one of the most indisputable methods of distinguishing the divine from the mortal in the Indian mythic mind. Fig. 16 Vishnu on Garuda (detail), Karnataka, early 19th century. Cat. 20. In the Hindu pantheon, the God Shiva is the ascetic yogi par excellence, but his images, even in the limited examples in the exhibition, reflect an enormous variety of forms (cats. 66–78). The most notable iconographic feature of his renunciate character is of course his matted hair, yet he is portrayed as a handsome youth. His third eye on the forehead, the source of his cosmic rage and energy, is not always present. By and large, he is conceived as a combination of a householder, frequently with his spouse Parvati, or Uma (who, like him, assumes wrathful forms as required), and a renunciate. Even in his angry or Bhairava form (cat. 74; fig. 15, cat. 77), he does not lose his youthfulness. The concept of yoga is also closely associated with the God Vishnu as in such iconographic forms as Yogavishnu, Yoganarasimha, and Yognarayana. In fact, as early as the Mahabharata, in the story of the sojourn and conversation in the Himalayan ashram called Badari between Nara (Man) and Narayana (one who inheres in Man), both are represented as yogis, as they also are in art. Narayana is also the name of the supreme form of Vishnu in the Pancharatra belief system (a highly ascetic branch of Vaishnavism), and in his recumbent image in the cosmic ocean on a couch formed by the cosmic serpent Ananta (Eternity), he is said to be in yoganidra, or meditative sleep (cat. 21). The pervasive influence of yoga is also encountered with the Devi or Durga such as Yogamaya (maya meaning “illusion”). Fig. 17 Detail of arch above Vishnu image showing Brahma, Shiva, and Dashavatara, Rajasthan, ca. 11th century. Cat. 15. Apart from the yogi, the mendicant, or the ascetic, the earthly ruler or the king, too, served as a model for the Gods of Indian mythologies from ancient times. The Vedic Indra, powerful king of the Gods, was given the elephant as his mount, the most enduring symbol of regal grandeur on the subcontinent. When the Greek conqueror Alexander confronted King Puru (Greek Porus) in the Punjab, the Indian ruler charged into battle on his elephant. Emulating most Indian kings, subsequent conquerors who settled in the country, notably the Mughals and the British, adopted the pachyderm as the most appropriate symbol of imperial pomp and circumstance. For the Hindus, Vishnu was the model of earthly rulers, and his representation was modeled on that of a king with every royal accoutrement. In fact, one of his epithets is Upendra, or Little Indra, the king of the Gods; he is also a Sun God and hence he rides the solar bird Garuda to survey the universe (fig. 16, cat. 20) and preserve cosmic order. Appropriately, his spouse is Lakshmi, the Goddess of good fortune, wealth, and prosperity, which are all essential for a successful ruler. In eastern India, he was further provided with a second consort in Sarasvati, the Goddess of wisdom, who in the South is Bhudevi, or the personified earth—and hence bhupal (protector of the earth) is a synonym for king. Fig. 18 Balarama as the eighth avatar of Vishnu, Madhya Pradesh, 11th century. Cat. 31. Fig. 19 Buddha as the ninth avatar of Vishnu, Madhya Pradesh, 11th century. Cat. 42. As the Cosmic Preserver, not only does Vishnu riding on Garuda roam the universe, but to save the world and his devotees or to restore moral order, he also periodically descends (avatirna) to earth as an avatar. 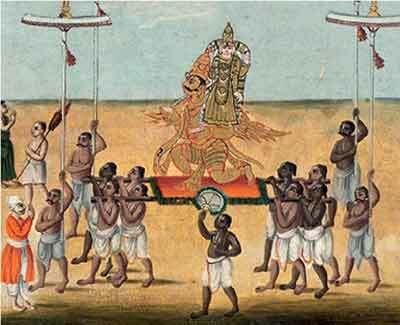 By the Gupta period, a group of ten avatars (Dashavatara) came to be especially recognized. 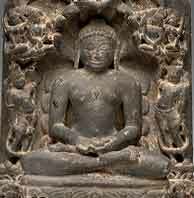 The exhibition includes a relief of Vishnu with all ten avatars represented together around the lotus halo (fig. 17, cat. 15). Two sandstone sculptures in the museum’s collection depicting Balarama (fig. 18, cat. 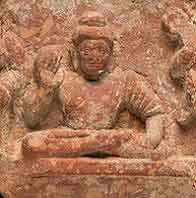 31) and the Buddha (fig. 19, cat. 42), the eighth and ninth avatars, respectively, are well known and rare examples of what must have been an impressive series of sculptures for a Dashavatara temple. Rajasthan or Gujarat, 19th century. Cat. 54. Among the other avatars, the exhibition includes several representations of Narasimha, the Man-Lion (see cats. 27–30), and of Rama, the hero of the epic Ramayana (fig. 20, cat. 35; see also cats. 36 and 37). It should be noted that most Hindus believe Rama was a historical figure and an ideal ruler; the expression Ramrajya (the rule of Rama) has come to mean good governance. In the Tanjore reverse glass painting, the only example of the technique introduced in India in the 18th century by immigrant Chinese artists, we glimpse a view of the ideal court of Rama. Flanking the green Rama and the fair Sita are Lakshmana displaying humility with crossed arms and a diminutive Hanuman (also green) in the attitude of devotion with his tail hanging down between his legs (cat. 36). The influence of a modern formal photographic portrait is evident. Even though Shiva is the archetypal ascetic God and the primal yogi, his hair is arranged in a jatamukuta (crown [mukuta] of matted hair). A tiger skin drapes his hips, and human skulls and serpents are his ornaments; yet, despite these symbols of asceticism, he is often shown bedecked in jewelry as befitting a king. The exhibition includes a variety of his representations from different periods that reflect his diverse imagery, the simplest being his symbolic form in a linga (literally “sign” and likely a word of non-Sanskrit origin), signifying both his generative organ and a cosmic pillar, while others are anthropomorphic and mythic figures (see cats. 61–63). Most of Shiva’s forms are pacific, but in some he is presented in his angry manifestation known as Bhairava, a later variation of Rudra of Vedic literature (see fig. 15). Here he is the Cosmic Destroyer of the Puranic triad where Brahma is the Creator and Vishnu the Preserver. No one who has witnessed religious processions or gaily dressed statutes in Catholic Latin America will be surprised to see the wide use of additional clothing for the principal deities in Hindu temples and shrines, public and domestic. Indeed, the most suitable expression of this dressage would be “regal,” both for the materials used and for the adornments, sometimes so profuse that only the deity’s eyes may be visible to the eager devotee. To complete the regal imagery, a tiara or crown is often added, even when the sculpted or modeled head beneath is already embellished. Generally, however, it is more common to use a piece of plain red cotton garment on the figure in Hindu temples, while a yellow piece drapes a Buddha and the Shvetambara Jains employ a length of white cloth. Just as the Sanskrit word bhagavan (possessor of fortune or share) is freely used by the Hindus to characterize Gods, so, too, the Jains and Buddhists honor their liberated teachers by the same qualifier, such as Bhagavan Buddha or Bhagavan Mahavira. In a similar fashion, the expression maharaja or maharaj (great king) is a common form of honorific address for both holy men and divinities by the followers of all three faiths. The spiritual majesty of the Buddha is emphasized in early Buddhist texts when he was declared the “King of Righteousness.” While the early representations of the historical Buddha are not literally crowned, the seat is a lion-throne (simhasana). In later Vajrayana ritual, it became obligatory to represent the “body of bliss” (sambhogakaya) suitably adorned and crowned. 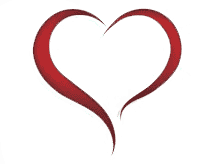 Tantric initiatory rites for spiritual transformation are similar to royal consecration ceremonies. The Jains, in due course, adopted similar abhisheka or initiatory rites and embellished the abstract, stylized images of their liberated or omniscient teachers with trappings of kingship, such as the triple umbrella above, the flywhisks held by attendants, and lustrating elephants (cats. 126 and 127). Finally, the last sermon of the liberated being in the Hall of Universal Sermon, or the samavasarana, is conceived as a grand audience or durbar as befits a universal monarch (cat. 124). Fig. 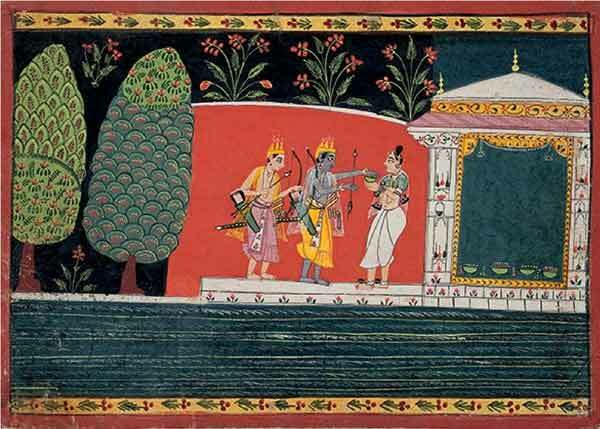 20 Rama and Lashmana approach a hermitage, Malwa, ca. 1680s. Cat. 35. Tamil Nadu, 16th century. Cat. 43. The most complex and charismatic Vaishnava, or even Hindu, deity represented in the exhibition is Krishna. He is the friend, counselor, and charioteer of Arjuna of the epic Mahabharata, for whom he brilliantly summarizes on the battlefield of Kurukshetra the essence of Hindu philosophy and theology in a poem called the Bhagavadgita that has become globally famous today. In a remarkable Rajput painting in the exhibition, we encounter Krishna’s Vishvarupa, or Universal Form; when to convince Arjuna, he demonstrates that everything in the universe owes its origins to him (fig. 21, cat. 54). To enable Arjuna to behold this awesome cosmic form, Krishna gives him divine sight, literally yogamishvaram, or yogic empowerment. Clearly, here Krishna resorts to a visual image when he is unable to persuade Arjuna with lengthy rhetoric. The Bhagavadgita is believed to have been composed about the time the earliest objects included in this exhibition were made, and advocates several ways to salvation, one of which is the path of yoga, already discussed, and another that of bhakti or devotion, which is expressed through puja and piety. Interestingly, while presenting the brief for war involving violence, the philosopher-God exhorts Arjuna that for personal salvation, unwavering faith in him, or for that matter any other deity, is a desideratum. This steadfast devotion also forms the crux of some of the avatar myths, such as that of Narasimha, when the boy devotee Prahlada is saved while the doubting Thomas of a king, Hiranyakashipu, is destroyed. A graphic work in the exhibition further demonstrates the theme of bhakti when Vishnu appears before another young devotee called Dhruva or Steadfast (cat. 17). In the early and traditional group of ten avatars, at least until the 12th century, Krishna is excluded in favor of his foster brother, Balarama. Both, however, were humble cowherders of Vrindavan rather than the kshatriya prince of Dwarka, who counseled Arjuna in the battlefield. It is this dark cowherder lad who is the flute-playing darling of the cowherder girls, scourge of the evil ruler Kamsa of nearby Mathura (whom he finally destroys though he does not sit on the throne himself), and, ultimately, the great lover of the singular cowherder girl Radha, who became the focus of popular devotion across the subcontinent. Krishna is also the most popular figure among the exhibits. His adventurous and mischievous feats have inspired generations of artists to sculpt or paint innumerable representations with both imagination and emotional intensity. No other Hindu deity embodies love in all its major psychological states with such perception and empathy. One can worship him as a mischievous crawling infant with a butter ball (fig. 22, cat. 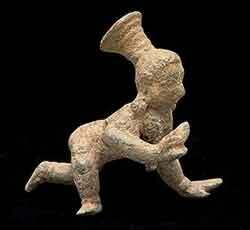 43), a dancing toddler (fig. 23, cat. 44), or an adolescent hero (fig. 24, cat. 47)—a youthful flute-player enchanting the cowherder girls, which became the favorite image of the God during the last five centuries of the millennium, especially in northern India. The exhibition includes multiple depictions of this form of Krishna—an extraordinary, richly carved, large wooden panel from Odisha, which may have been used as a temple door (see fig. 34, cat. 48), as well as stone and metal images intended for domestic shrines (see cats. 45–47). Fig. 23 A dancing toddler Krishna, Tamil Nadu, 17th century. Cat. 44. Fig. 24 A cosmic six-armed flute-playing Krishna, Odisha or Bengal, 19th century. Cat. 47. No deity has inspired and influenced the art of painting as ubiquitously as Krishna, as is clear from the number and diversity of pictures of this God in the exhibition. Also included are a few devotional pictures created in the 19th century around the famous Kali temple in Kolkata in a distinctive style that has come to be known as the Kalighat school (see cats. 32, 52, and 53). While these freely limned images were popular with pilgrims, the school also delineated contemporary societal and satirical themes that were popular with visitors both native and foreign. Buddhists also produced vast quantities of portable paintings on cloth and paper at their monasteries and shrines, which have not survived in India but were preserved in Nepal and Tibet, where they strongly influenced local pictorial traditions. Vishvarupa of the Bhagavadgita discussed above (see fig. 21, cat. 54). The cosmographical pictures are the only survivals of the ancient tradition of mandala painting, lost on the subcontinent but enduring elsewhere in Asia. In fact, the exhibition includes rare three-dimensional examples of Jain mandalas in stone and metal (cats. 118–120). Rajasthan, 19th– 20th century. Cat. 56. Such large paintings were also produced by the Vaishnavas, who lived in the same geographic and cultural zone as the Jains in western India and in the Vaishnava stronghold in Odisha on the east coast. A number and variety of objects in the exhibition are from two leading centers of Krishna worship: Puri in the state of Odisha and Nathdvara in the desert state of Rajasthan. Both are important pilgrimage sites for devout Vaishnavas and are visited annually by millions of pilgrims. The Puri temple dedicated to Jagannath (Lord of the World) is the older shrine, while Nathdvara was established in the 16th century by the charismatic philosopher-teacher Vallabhacharya (active 1481–1533). Both temples have had enormous influence among Hindu courts and communities far beyond their location. Arts created for devotees and pilgrims at the two centers have influenced devotional imagery elsewhere. 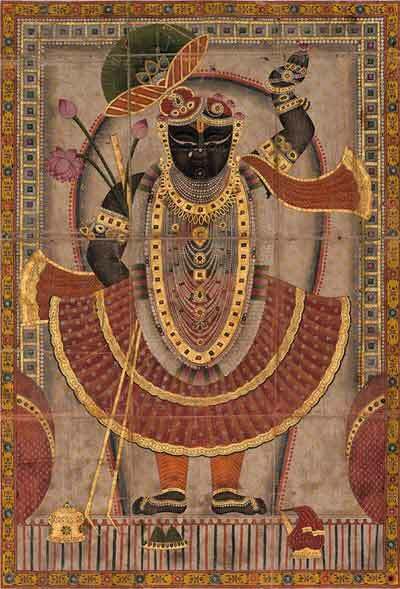 Several of the Nathdvara style of monumental paintings with diverse subjects and forms reflect with visual panache the glory of Krishna’s divine splendor (fig. 26, cat. 56), while the select smaller examples on paper in a wide variety of styles with narrative content as well as literary conceits depict what is characterized in literature as Krishnalila, or the Divine Play of Krishna. Fig. 27 The Jagannath temple triad, Odisha, late 19th–20th century. Cat. 34. The Jagannath temple of Puri is an ancient shrine of even greater antiquity than the current impressive 13th-century temple complex visited by countless Hindu pilgrims. Consisting of a triad, the deities are identified as Krishna as Jagannath, his brother, Balabhadra (Balarama), and their sister, Subhadra, a manifestation of the great Goddess. Even their iconographic representations (cat. 33; fig. 27, cat. 34) are unusual to say the least: they reflect a tribal aesthetic and are among the most exotic and geometric forms used in a major Hindu temple. It should be mentioned that not only do local tribal communities participate in the temple ritual but every twelve years the timber images in the main shrine are replaced with freshly carved examples intended to be impermanent, whereas most principal images in temples of all three religions are created of stone or metal for greater permanence. We, however, use the word brahman with a lower case b to denote the caste, while Brahman will be employed for the Absolute, and Brahma for the name of the Creator deity of the Hindu triad. 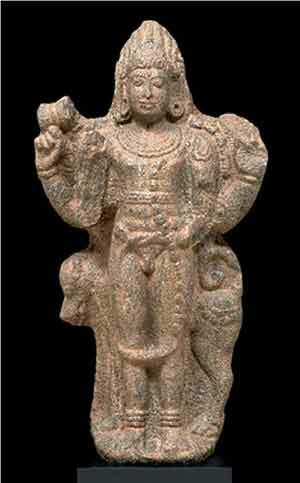 [2 For the earliest Jain images and their austere form, see Cort 2010, especially chap. 1. For other examples of Vishnu in his yogic forms, see Banerjea 1956, pl. XXIII, 2 and XXIV, in both of which his regal and yogic forms are combined. Banerjea’s book is still the best for the study of Hindu iconography and the origin of the earliest artistic forms of divinity in India. H indus also believe in the historicity of Rama but not with incontrovertible and corroborative archaeological evidence. Kalki is the apocalyptic figure who will arrive riding a horse. See Larson 1995 for a discussion of the Hindu–Jain nexus. See Wayman 1973: the first of six initiations is of water and the second of the diadem (p. 68). In fact, Vajrayana priests often wear diadems during religious ceremonies, as seen in art from eastern India, Nepal, and Tibet. Gita 11.8: “I grant you divine sight that you may behold my universal form.” Divyam dadāmi te chakshu pashya me yogamaishvaram / 11.8. Interesting is the characterization of this power to view the cosmic form as “yogic manifestation.” Note also the removal of the nescient eye and the opening of the knowledge eye in the sixth initiation ceremony with the mirror in Vajrayana (Wayman 1973, pp. 68–70). Gita 9.23: “Unknowingly they venerate me even when the devotees worship any other deity with absolute faith.” This verse demonstrates both a tolerant attitude and an emphasis on unalloyed bhakti. The necessity of absolute faith is repeated in several verses elsewhere in the text. Barbara Stoller Miller, Love Song of the Dark Lord: Jayadeva’s Gitagovinda (New York: Columbia University Press, 1977). Archeology 2001 . Vol. II: Historical Archeology and Art History, pp. 345–54. Paris: Editions Recherché sur le Civilisations. Alphen, Jan Van, ed. 2000. Steps to Liberation: 2,500 Years of Jain Art and Religion. Antwerpen: Etnografisch Museum. Banerjea, Jitendra Nath. 1956. The Development of Hindu Iconography. Calcutta: University of Calcutta. Bhattacharya, Brindavan Chandra. 1974. The Jain Iconography. 2nd rev. ed. New Delhi: Motilal Banarsidass. Bhattacharyya, Benoytosh. 1968. The Indian Buddhist Iconography, Mainly Based on the Sādhanamālā and Cognate Tāntric Texts and Rituals. 2nd rev. ed. Calcutta: Firma K. L. Mukhopadhyay. Brancaccio, Pia, ed. 2013. Living Rock Buddhist, Hindu and Jain Cave Temples at Ellora. Mumbai: Marg Foundation. Coomaraswamy, A. K. See Lipsey 1977. Cort, John E. 1995. 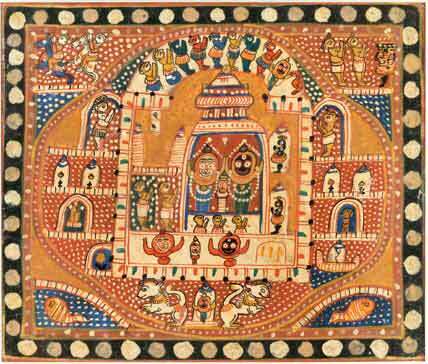 “Following the Jina, Worshipping the Jina: An Essay on Jain Rituals.” In Pal 1995a, pp. 57–62. ———. 2010. 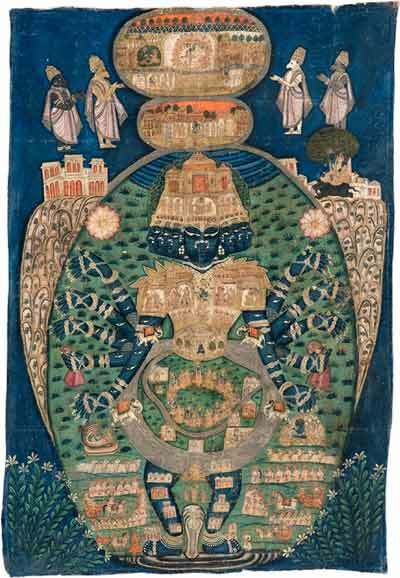 Framing the Jina : Narratives of Icons and Idols in Jain History. New York: Oxford University Press. Digambar Home Shrines in Jaipur.” Jaina Studies: Newsletter of the Centre of Jaina Studies 10: 31–34. Cummings, Joan 2011. Vishnu: Hinduism’s Blue-Skinned Savior. New York: Brooklyn Museum. Dallapiccola, Anna L. 1989. Shastric Traditions in Indian Arts. Stuttgart: Steiner. Davis, Richard H. 1997. Lives of Indian Images. Princeton, NJ: Princeton University Press. ———. 1998. Images, Miracles, and Authority in Asian Religious Traditions. Boulder, CO: Westview Press. In Jan Assmann and Albert I. Baumgarten, eds., Representation in Religion: Studies in Honor of Moshe Barasch. Leiden: Brill. Diamond, Debra. 2013. Yoga: The Art of Transformation. Washington, DC: Smithsonian Institution. Doniger, Wendy. 2015. “Hinduism.” In Jack Miles, ed., The Norton Anthology of World Religions. New York: W. W. Norton. Fynes, R. C. C., tr. 1998. Hemacandra: The Lives of the Jain Elders. Oxford: Oxford University Press. Granoff, Phyllis. 2009a. Victorious Ones: Jain Images of Perfection. New York: Rubin Museum of Art. ———, ed. 2009b. Jain Art, Philosophy, and Cosmology. New York: Rubin Museum of Art. Jaini, Padmanabha S. 1979. The Jaina Path of Purification. Berkeley: University of California Press. ———. 2000. Collected Papers on Jaina Studies. Delhi: Motilal Banarsidass Publishers. ———. 2001. Collected Papers on Buddhist Studies. Delhi: Motilal Banarsidass Publishers. Kramrisch, Stella. 1981. Manifestations of Shiva. Philadelphia: Philadelphia Museum of Art. Larson, Gerald. 1995. “Are Jains Really Hindus? Some Parallels and Differences between Hindu and Jain Philosophies.” In Pal 1995a, pp. 57–63. Leidy, Denise Patry, and Robert A. F. Thurman. 1997. Mandala: The Architecture of Enlightenment . New York: Asia Society Galleries. Lipsey, Roger. 1977. Coomaraswamy Selected Papers. Vol. 1: Traditional Art and Symbolism. Princeton, NJ: Princeton University Press. Maxwell, T. S. 1988. Viśvarūpa. Delhi: Oxford University Press. Lopez, Donald S., Jr. 2015. “Buddhism.” In Jack Miles, ed., The Norton Anthology of World Religions. New York: W. W. Norton. Pal, Pratapaditya. 1984. Light of Asia: Buddha Sakyamuni in Asian Art. Los Angeles: Los Angeles County Museum of Art. ———. 1995a. The Peaceful Liberators: Jain Art from India. Los Angeles: Los Angeles County Museum of Art. ———, ed. 1995b. Ganesh the Benevolent. Bombay: Marg Publications. Pollock, Sheldon I. 2006. The Language of the Gods in the World of Men: Sanskrit, Culture, and Power in Premodern India. Berkeley: University of California Press. Quintanilla, Sonya R. 2007. History of Early Stone Sculpture at Mathura, ca. 150 bce–100 ce. Leiden: Brill. Qvarström, Olle, ed. 2003. Jainism and Early Buddhism: Essays in Honor of Padmanabha Jaini. Fremont, CA: Asian Humanities Press. Shah, Priyabala, ed. 1958. Viṣṇudharmottara-Purāṇa: Third Khaṇḍa. 2 vols. Baroda: Oriental Institute. Shah, Umakant P. 1975. “Evolution of Jain Iconography and Symbolism.” In Shah and Dhaky 1975, pp. 49–76. ———, ed. 1995. Studies in Jain Art. Varanasi: Jain Cultural Research Society. Jain Art and Architecture . Ahmedabad: Gujarat State Committee for the Celebration of the 2,500 Anniversary of Bhagavan Mahavira Nirvana. Slusser, Mary S. 1982. Nepal Mandala. 2 vols. Princeton, NJ: Princeton University Press. Srinivasan, Doris. 1997. Many Heads, Arms, and Eyes: Origin, Meaning, and Form of Multiplicity in Indian Art. Leiden: Brill. Tiwari, M. N. P. 1983. Elements of Jain Iconography. Varanasi: Indological Book House. 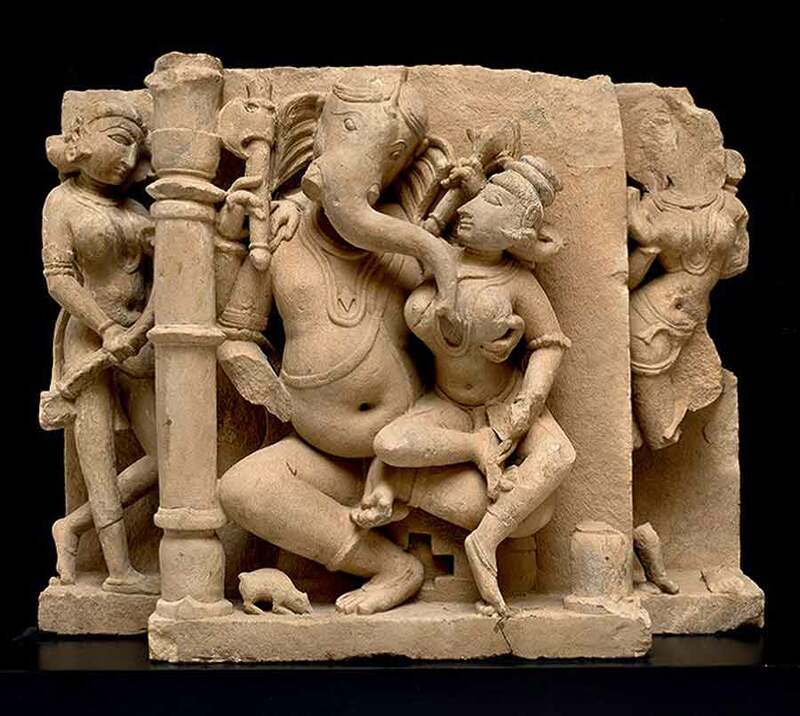 Monsoon Culture and the Art of Ancient South Asia . Mumbai: Marg Foundation. Vasantharaj, M. D. 1985. “Puja or Worship as Practised among the South Indian Jainas.” In Third International Jain Conference Souvenir Volume, pp. 98–100. New Delhi: Ahimsa International. Wayman, Alex. 1973. The Buddhist Tantras. New York: Samuel Weiser. Zimmer, Heinrich. 1946. Myths and Symbols in Indian Art and Civilization. Edited by Joseph Campbell. New York: Pantheon Books. ———. 1968. The Art of Indian Asia: Its Mythology and Transformations. New York: Princeton University Press. ———. 1984. Artistic Form and Yoga in the Sacred Images of India. Translated by G. Chapple and J. B. Lawson. Princeton, NJ: Princeton University Press.